Aims and Objectives: To evaluate the effectiveness of school-based oral health educational (OHE) projects on oral health knowledge of government primary and intermediate students sponsored by King Salman Center for Children's Health (KSCCH) in Riyadh city, Saudi Arabia. Materials and Methods: OHE data of 2013–2014 semesters and 2014–2015 first semesters of government (n = 813) primary and intermediate school students were extracted from the KSCCH projects undertaken by Riyadh Elm University, Riyadh, Kingdom of Saudi Arabia. Student's oral health knowledge was assessed before and after OHE by administering pre/post-questionnaire. 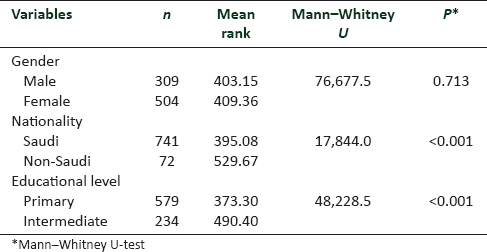 Total and topic-specific knowledge scores were reported and compared between gender, nationality, and educational level using nonparametric Mann–Whitney U-test and Wilcoxon's signed-rank test. Results: After the educational session, high and medium knowledge score categories showed an increase of 20.3% and 5.2%, respectively. On the contrary, low knowledge score category showed a decrease of 25.5% participants. This observed change was statistically significant (P ≤ 0.001). Comparison of correct responses between pretest and posttest showed statistically significant (P < 0.05) increase in correct responses in all the questions, except on the knowledge of effect sweet retention on teeth. Non-Saudi nationals and students in the intermediate level demonstrated significantly high mean knowledge ranks at posttest assessment (P < 0.001). Conclusions: Educational projects sponsored by KSCCH demonstrated a definite positive impact on oral health knowledge of government primary and intermediate school students in Riyadh city, Saudi Arabia. For prolonged retention of oral health knowledge, repetition and reinforcement of OHE are necessary. Oral health education (OHE) defined as any learning activity which aims to improve individuals' knowledge, attitudes, and skills relevant to their oral health. School days are the most important time of a child's life. Oral health programs spreading preventive information during this period shape an individual's attitudes, beliefs, and skills to a large extent. Besides, OHE in school-based settings is acknowledged to develop personal skills and promote positive attitudes and healthy behaviors in children. Riyadh Elm University obtained approval of His Royal Highness King Salman Bin Abdulaziz to establish the King Salman Center for Children's Health (KSCCH). The vision of KSCCH is to become an excellent center in the areas of research, monitoring, and health education for children of Riyadh city to have a local and global impact. The mission of KSCCH is the pursuit of knowledge that benefits humanity and believes in building a team of multiple parties to participate with the knowledge and culture and to create the generation of children free from diseases and armed with science. KSCCH undertakes numerous health awareness projects targeted toward schoolchildren, the general public, and professionals. Center provides health education programs by organizing lectures, media presentations, and distribution of posters and leaflets containing health information. KSCCH invites national and international experts to update the developments within the fields of dentistry and medical sciences by organizing conferences and workshops. KSCCH and Riyadh Elm University together carried out many OHE projects during the 2013–2014 semesters and 2014–2015 first semester in government primary and intermediate schools. The effect of such educational project on oral health knowledge of school students has not reported until now. Hence, the present study evaluated the effectiveness of school-based OHE projects on oral health knowledge of government primary and intermediate students sponsored by KSCCH in Riyadh city, Saudi Arabia. The study proposal was submitted to the Ethical Review Committee, and approval for the study was obtained from the Research Center of Riyadh Colleges of Dentistry and Pharmacy (RCsDP). The study was registered with registration number FPGRP/43548006/21. Informed consent was obtained for the purpose of this study. Eight hundred and thirteen government and intermediate school students aged 8–15 years who were part of the health educational projects carried out during the 2013–2014 semesters and 2014–2015 first semesters in Riyadh city, Saudi Arabia, were included. For evaluation, a pre-posttest design was chosen, and a knowledge assessment instrument that evaluated the dental health knowledge of the participants before and after the OHE sessions was developed. English version of the questionnaire was designed based on the WHO information series on school health and validated by seeking dental public health and periodontology expert opinions. Forward and backward translation method was utilized to translate the English version of the questionnaire into native Arabic language. The questionnaire was pilot tested among a sample (n = 30) of students to make questionnaire simple and short. Questionnaire field tested to know its ease of use and knowledge gains accurately. Cronbach's alpha value of 81% obtained suggesting adequate reliability. The instrument consisted of 18 multiple-choice questions with only one appropriate answer to each question. Questionnaire was made up of six parts; Part I – demographic information (age, gender, nationality, educational level, and school type), Part II – structure, functions, and types of the teeth, Part III – food and tooth decay, Part IV – toothbrushing-related information, Part V – oral and general health relations, and Part VI – consequences loss of teeth and orthodontic knowledge. Dental interns distributed pretest questionnaire to the students during a school visit, and their responses were collected and stored in an envelope. This pretest gave baseline knowledge score for each student. Students then received 30 min of lectures with interactive learning and video presentations on oral health topics. Later, at the end of the session, the same participants received posttest questionnaire to evaluate the knowledge gain. The process of OHE and evaluation is displayed in [Figure 1]. Permission to use OHE data for the publication purpose was taken from the Director of Internship Quality Assurance Office of REU. From this database, only pre/post-questionnaire information about the government primary and intermediate school students was retrieved. On the contrary, data of primary and intermediate students from private schools was excluded from the analysis. Before conducting any statistical analyses, a total of 2200 case records of health educational projects carried out during 2013–2014 semesters and 2014–2015 first semester of the participants were screened for missing values. One hundred and eight cases with unfilled demographic information or blank responses to the questions were excluded from the analysis. Similarly, 1279 cases were excluded because of data from private schools. Thus, only 813 primary (n = 579) and intermediate (n = 234) students from government schools having pretest and posttest results were included in the final analyses. By considering 5% margin of error and 95% confidence interval, a response distribution of 50 and population size of 20,000 in online Raosoft ® sample size calculator yielded a minimum sample of 377. To increase the power of the study, all the cases (n=813) were included in the analysis. Shapiro–Wilk test was performed to check the normality distribution, and the data were found to be nonnormally distributed (P < 0.05). Descriptive statistics of frequency distribution, percentages, and mean knowledge scores were calculated before and after education. Nonparametric tests were utilized to determine the overall knowledge score difference of pre/post-scores. Changes in overall knowledge was assessed with regard to age, gender, nationality and education level. Every multiple-choice question had a single-most appropriate response. Every correct answer in pre/post-questionnaires scored 1 and wrong answers scored 0. An overall composite score was then created, by adding the individual scores of each question. The highest possible overall score was 18, and the lowest possible score was 0. The overall score was categorized into low, medium, or high based on the number of correct responses. The low category included an overall score of 9 or less, the medium category 10–14, and the high category 15–18. Percentages for the low, medium, and high category were obtained for both pre- and post-test. The percentage change was then calculated by subtracting the pretest percentage from the posttest percentage. Topic-specific knowledge assessment tested improvement in participant's knowledge in definitive areas of the oral health. Wilcoxon's signed-rank test was used to assess the topic-specific changes in knowledge. For all statistical purposes, P < 0.05 was considered statistically significant. All the analyses accomplished using SPSS Version 21 software (IBM, Armonk: New York, USA) Software. Demographic characteristics of the study participants showed that the highest percentage (21.9%) of the study participants were aged 9 years, followed by 10 years (20%), 8 years (18.7%), 15 years (10.8%), 11 years (8.7%), 12 years (7.4%), 14 years (6.4%), and 13 years (6%), respectively. Gender distribution showed that the majority of the study participants were females (62%) as compared to males (38%). Of the study participants, Saudi students (91.1%) and those studying in the primary level of education (71.2%) were more as compared to the non-Saudi (8.9%) students and intermediate level of education (28.8%) (Part I). The second part of the questionnaire elicited overall knowledge of tooth type, structure, and functions of the study participants. Pretest correct answers concerning the need for teeth, sets of dentition, number of primary and permanent teeth, and layers of the tooth were 54.1%, 29.4%, 28.9%, 32.5%, and 33.2%, respectively. After OHE, session posttest evaluation showed 67.5%, 36%, 66.2%, 59.5%, and 57.4% correct answers for the same questions, suggesting an increase in the level of knowledge of study participants. The third part of the questionnaire assessed about the dental plaque and caries-related questions. Pretest correct answers related to meaning of dental plaque, dental plaque can cause, soft drinks affect tooth adversely, effect of sweet retention on dentition, and reason for tooth decay were 22.8%, 29.6%, 81.2%, 82.8%, and 61.1%, respectively. After OHE, posttest responses were 46%, 45.8%, 88.6%, 82.3%, and 80.7%, indicating an increase in the knowledge, except for the questioning effect of sweet retention on the teeth in which responses did not change. The fourth part assessed the overall responses of the study participant's toothbrushing habits and related questions. Before oral health education correct answers concerning frequency and the timing of daily toothbrushing, interval of changing toothbrush, and methods of prevention of tooth decay were 67.9%, 65.7%, 76.5%, 37.1%, and 78.7%, respectively. After OHE posttest correct responses to same questions were 75.4%, 70.4%, 85.9%, 45.6%, and 88.2%, respectively. These posttest responses reflect an increase in the oral health knowledge among the study participants. The fifth part of the questionnaire evaluated the relationship between oral health and general health and effect of loss of teeth. Pretest correct responses to the questions were 53.8% and 66.7%, respectively. However, after OHE session, the percentage of correct responses increased to 76.3% and 83.8%. These findings exhibit improvement in the oral health knowledge level. The sixth part of the questionnaire evaluated the orthodontic awareness of study participants by asking is it possible to move irregularly placed teeth into correct position; correct pretest answer for this question was 62%; after oral health session, it increased to 81.2% as evidenced by posttest results. The study results revealed that the number of participants in the high score category (14–18 correct responses) increased from 11.2% at baseline to 31.5% after the OHE session; a significant increase of 20.3% was observed. Similarly, the number of participants in the medium score category also changed from 43.3% at baseline to the 48.5% posttest. Consequently, there was a decrease in the number of participants who were in the low score category from 45.5% at baseline to 20% post-OHE test, indicating that a significant number of participants had performed well on the knowledge assessment test after the OHE session. The differences in knowledge before and after the intervention were statistically significant (P < 0.001) as shown in [Figure 2]. Total percentage of male (70.6%) and female (30.2%) study participants in low knowledge score category at pretest level reduced to 24.9% and 17.1% after OHE. Similarly, the percentage of Saudi (47%) and non-Saudi nationals (30.6%) in low knowledge score category at pretest level reduced to 21.3% and 6.9%, respectively. Total percentages of primary (57.7%) and intermediate (15.4%) school study participants in low knowledge score category at pretest level reduced to 24.7% and 8.5%, posttest, respectively, as shown in [Table 1]. In medium score category, pretest versus posttest changes were as follows; male – 28.8% versus 42.1%, female – 52.2% versus 52.4%, Saudi – 42.8% versus 49.4%, non-Saudi – 48.6% versus 38.9%, primary – 40.9% versus 48.5%, and intermediate – 49.1% versus 48.3%. High score category showed male – 0.6% versus 33%, female – 17.7% versus 30.6%, Saudi – 10.3% versus 29.3%, non-Saudi – 20.8% versus 54.2%, primary – 1.4% versus 26.8%, and intermediate – 35.5% versus 43.2% pretest and posttest changes in oral health knowledge. Thus, total percentages of study participants belonging to the different gender, nationality, and educational levels in medium and high knowledge score category changed from baseline to posttest after OHE session, as shown in [Table 1]. Topic-specific analysis of correct answers showed variable responses for different questions. Correct responses ranged from 22.8% to 82.8%, at pretest before providing OHE. Lowest (22.8%) right answer observed for the question what does dental plaque mean followed by how many milk teeth do we have (28.9%); the correct response rate was found with the items how many sets of dentition do we have (29.4%), what dental plaque can cause (29.6%), how many permanent teeth do we have (32.5%), how many layers are there in the tooth (33.2%), and what should be the interval for a change of toothbrush (37.1%). Similarly, more than half of the correct responses were found with the questions; does the health of mouth and dentition impact the health of the body (53.8%), why do we need our teeth (54.1%), what is the reason for tooth decay (61.1%), is it possible to move irregularly placed teeth into correct position (62%), daily when one should brush teeth (65.7%), can loss of teeth interfere with speech (66.7%), and how many times one should brush every day (67.9%). More than two-thirds correct responses were found with the questions; what is the purpose of tooth brushing (76.5%), what are the methods to prevent dental decay (78.7%), soft drinks affect tooth adversely (81.2%), and what is the effect of sweets retention on dentition (82.8%), as shown in [Table 2]. After OHE, percentages of correct responses increased and this increment ranged from 36% to 88.6% as shown by posttest assessment. The lowest posttest correct responses observed with the question on sets of dentition (36%) followed by the interval of changing toothbrush (45.6%), what dental plaque can cause (45.8%), and what dental plaque mean (46%). More than half of the correct posttest responses found with the questions; how many layers are there in tooth (57.4%), how many permanent teeth do we have (59.5%), how many milk teeth do we have (66.2%), why do we need teeth (67.5%), and routinely when one should brush the teeth (70.4%). More than two-thirds of correct answers were observed with questions; how many times one should brush the teeth (75.4%), does the health of the mouth and dentition impact the health of the body (76.3%), what is the reason for tooth decay (80.7%), is it possible to move irregularly placed teeth into correct position (81.2%), what is the effect of sweets retention on dentition (82.3%), can loss of teeth interfere with speech (83.8%), what is the purpose of tooth brushing (85.9%), what are the methods to prevent dental decay (88.2%), and are soft drinks affecting tooth adversely (88.4%), as reported in [Table 2]. In general, topic-specific questions showed an increase in the number of correct responses after OHE session. 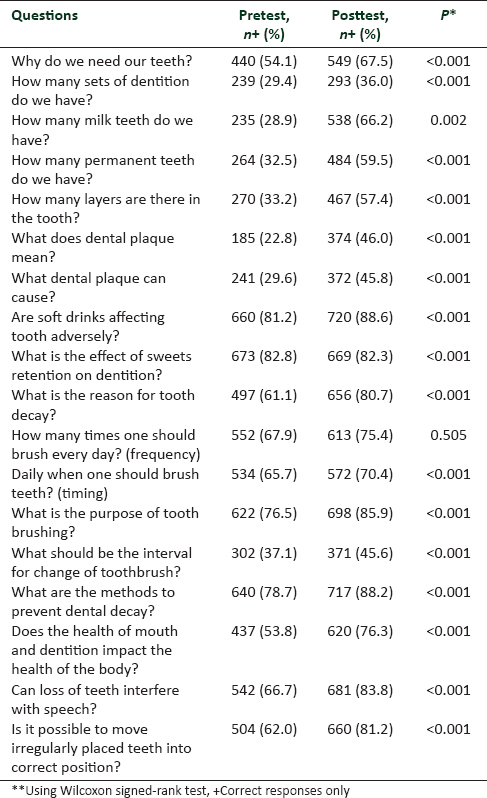 Further comparison of correct answers between pretest and posttest showed statistically significant (P < 0.05) increase in all the questions, except for the issue related to the frequency of tooth brushing as indicated in [Table 2]. In the present study, non-Saudi nationals and those students in the intermediate level of education showed significantly higher mean knowledge ranks (P < 0.001) at posttest assessment, suggesting improvement in knowledge as shown in [Table 3]. The main objective of school OHE is to help children develop lifelong personal skills, to rise health consciousness, improve understanding and healthy attitudes, to promote healthy behaviors, and thereby to reduce risks of oral disease. This study demonstrated an increase in the short-term oral health knowledge of the participants following an OHE intervention. Knowledge scores are categorized into low, medium, and high based on the number of correct responses. Total percentages of study participants in the low and medium knowledge categories reduced and high knowledge category increased significantly after OHE intervention. Similarly, correct responses to the individual questions increased significantly after OHE intervention as evidenced by changes in pretest to posttest scores. The favorable results observed in the present study indicated the effectiveness of OHE programs and provided evidence that facilitates continuation of such programs for improvement in the oral health of the schoolchildren. Schools are ideal social settings for providing OHE for students and staff. The collaboration between educational institutions and health education providing health agencies such as KSCCH can have an impact in overcoming dental health care access problems and resource. Majority of the children belonging to lower socioeconomic strata can avail benefits that in turn help reduce existing oral health disparity across different socioeconomic groups. The effectiveness of increased knowledge transforming into actual behavior change is vast. However, it has been widely accepted that knowledge alone may not necessarily develop positive attitudes or change of behavior. Hence, knowledge in conjunction with other external factors such as family situations, peer influences, local customs and cultural values, social influences, and availability of resources is needed to affect the behavior. Therefore, it is difficult to expect provision of knowledge alone could bring required health gains. Moreover, its ethical responsibility of the dental professionals to provide needed health information and at the same time to access to health information is the right of every individual. School students who were provided with health information during their early years have a chance to realize the importance of adopting good habits and healthy choices. Oral health knowledge forms the prerequisite for optimal dental health. However, it is important to know the existing level of oral health knowledge among primary and intermediate school children to design an effective preventive program. The present study disclosed an improvement in oral health knowledge among primary and intermediate government school students after an educational intervention. This finding is supported by Blake et al. among primary schoolchildren. All students completed a questionnaire on oral health-related knowledge and self-reported oral health-related behaviors before, immediately after, and after 6 weeks following the educational intervention. The study results showed significantly increased dental knowledge following intervention, with improvement visible at immediate follow-up, and maintained 6 weeks later. In addition, the study reported increased use of dental floss among children after the intervention when compared to pretest evaluations. However, our study did not include any performance of oral health behavior instead it explored the changes in oral health knowledge immediately after the intervention. Another educational interventional study  carried out among aboriginal primary schoolchildren showed similar increased oral health knowledge. A questionnaire was administered to the children at the start of the year and then again at the end of the year. Questionnaire assessed the children's dental care knowledge before and after the intervention with educational activities. Plaque scores were reduced and oral health care knowledge improved among aboriginal children. Hence, authors suggested that intervention with educational activities can improve children's dental care knowledge and is a feasible and effective approach to solve this problem where resources are scarce and the prevalence of oral diseases is on the rise among children. OHE intervention study  conducted on schoolchildren in Bangladesh showed similar findings as that of our study. At baseline, students were assessed for oral health knowledge, attitude, and practices using a self-administered structured questionnaire and untreated dental caries was assessed using clinical examination. Follow-up study was carried out after 6 months from baseline. Impact of OHE program on oral health was evaluated between baseline and follow-up on four areas of knowledge, attitude, practices, and untreated tooth decay. The comparative evaluation suggested a significant increase in oral health knowledge, attitude, and practices scores and a decrease in the untreated tooth decay, as compared to baseline data. This study showed improved oral health knowledge after the OHE intervention. Similarly, Iranian study  conducted among school students showed promising results in improving oral health knowledge with OHE being provided at both school and home settings. Numerous school-based OHE programs have shown successful outcomes in improving knowledge-related oral hygiene and gingival health.,, Repetition and reinforcement have been shown to play a crucial role in the sustainability of the effect of OHE programs. The repetition and reinforcement can be undertaken irrespective of educators. The trained teachers and peers can play a complementary role in repetition and reinforcement of OHE. In line with this finding, Al-Kheraif and Al-Bejadi reported an increase in the awareness of oral health among female schoolchildren. On the contrary, no effort was made to provide repetition and reinforcement of OHE due to several constraints. The study results are based on secondary data extracted from the OHE projects sponsored by KSCCH in Riyadh city without disturbing the school schedule repeatedly for study purpose. Furthermore, this study exclusively focused on knowledge changes in government primary and intermediate children. The use of a matched pair pre/posttest design and large sample size were the strengths of the study. The matched pair pre/post design helped for the assessment of individual knowledge changes and minimized errors due to potential confounders. One of the distinctive limitations of the present study was the absence of a control group. After providing OHE, posttest assessment was carried out immediately to measure the knowledge gain the same day. The study did not attempt to measure the transformation knowledge gain into actual behavior changes. There may be a possibility of over- or under-reporting of the oral health information from the students due to the social desirability. Data were extracted purely from primary and intermediate students studying in government schools of Riyadh city. Hence, generalization of the study results is limited. The results of the current study have significant implications for the stakeholders of the OHE projects, particularly KSCCH, REU, government school authorities, students, and parents. The present study results provided evidence of successful OHE projects undertaken by dental interns of REU and sponsored by KSCCH in Riyadh city. It also disclosed positive efforts of entire team members involved in educational projects. The successful outcome of the KSCCH educational projects can be extended to increase more participation and build stronger relationships with the school communities. In addition, direct benefits accrued by the child through these educational programs will help in improving the parental cooperation at home for oral health preventive practices. The findings of this study revealed that the student's level of oral health knowledge increased remarkably after OHE session as evidenced by posttest results. This increase was suggestive of short-term gain in oral health information. An effort should be made to consider control groups while evaluating OHE projects. Neighboring schools within the geographic area should be chosen as control school. OHE projects sponsored by KSCCH have demonstrated a definite positive impact on oral health knowledge of government primary and intermediate school students in Riyadh city, Saudi Arabia. For prolonged retention of the oral health knowledge, repetition and reinforcement of OHE are necessary. Futuristic approach should include clinical and behavioral components to measure the impact of educational programs among school students. We would like to thank Quality Assurance Internship Office of Riyadh Elm University for providing needed help and support during the study. King Salman Center for Children's Health supported the study. Kay JE, Locker D, Britain G. Effectiveness of oral health promotion: A review. Health Education Authority. London: Health Education Authority; 1997. Kwan SY, Petersen PE, Pine CM, Borutta A. Health-promoting schools: An opportunity for oral health promotion. Bull World Health Organ 2005;83:677-85.
al-Shammery AR, Guile EE, el-Backly M. Prevalence of caries in primary school children in Saudi Arabia. Community Dent Oral Epidemiol 1990;18:320-1. Gandeh MB, Milaat WA. Dental caries among schoolchildren: Report of a health education campaign in Jeddah, Saudi Arabia. East Mediterr Health J 2000;6:396-401. Farooqi FA, Khabeer A, Moheet IA, Khan SQ, Farooq I, ArRejaie AS, et al. Prevalence of dental caries in primary and permanent teeth and its relation with tooth brushing habits among schoolchildren in Eastern Saudi Arabia. Saudi Med J 2015;36:737-42. Smyth E, Caamaño F. Factors related to dental health in 12-year-old children: A cross-sectional study in pupils. Gac Sanit 2005;19:113-9. Ab-Murat N, Watt RG. Chief dentists' perceived strengths and weaknesses of oral health promotion activities in Malaysia. Ann Dent Univ Malaya 2006;13:1-5. Al-Omiri MK, Al-Wahadni AM, Saeed KN. Oral health attitudes, knowledge, and behavior among school children in North Jordan. J Dent Educ 2006;70:179-87. Chapman A, Copestake SJ, Duncan K. An oral health education programme based on the national curriculum. Int J Paediatr Dent 2006;16:40-4. Blake H, Dawett B, Leighton P, Rose-Brady L, Deery C. School-based educational intervention to improve children's oral health-related knowledge. Health Promot Pract 2015;16:571-82. Chizan-Chung C, Huai-Kuan H, Ming-Jay H, Chizan-Hao W. Educational intervention can improve dental care knowledge in aboriginal tribal children. Tzu Chi Med J 2011;23:86-9. Haque SE, Rahman M, Itsuko K, Mutahara M, Kayako S, Tsutsumi A, et al. Effect of a school-based oral health education in preventing untreated dental caries and increasing knowledge, attitude, and practices among adolescents in Bangladesh. BMC Oral Health 2016;16:44. Yekaninejad MS, Eshraghian MR, Nourijelyani K, Mohammad K, Foroushani AR, Zayeri F, et al. 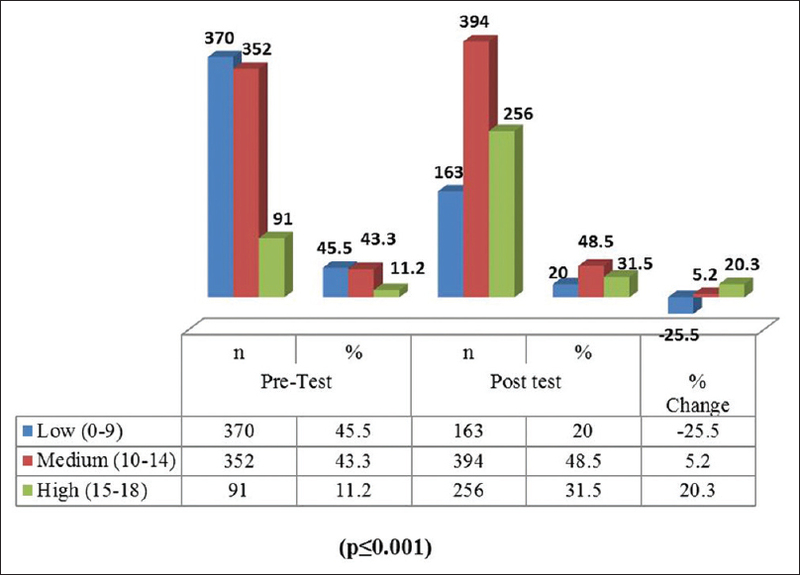 Effect of a school-based oral health-education program on Iranian children: Results from a group randomized trial. Eur J Oral Sci 2012;120:429-37. D'Cruz AM, Aradhya S. Impact of oral health education on oral hygiene knowledge, practices, plaque control and gingival health of 13- to 15-year-old school children in Bangalore city. Int J Dent Hyg 2013;11:126-33. Yazdani R, Vehkalahti MM, Nouri M, Murtomaa H. School-based education to improve oral cleanliness and gingival health in adolescents in Tehran, Iran. Int J Paediatr Dent 2009;19:274-81. Tolvanen M, Lahti S, Poutanen R, Seppä L, Pohjola V, Hausen H, et al. Changes in children's oral health-related behavior, knowledge and attitudes during a 3.4-yr randomized clinical trial and oral health-promotion program. Eur J Oral Sci 2009;117:390-7. Haleem A, Khan MK, Sufia S, Chaudhry S, Siddiqui MI, Khan AA, et al. The role of repetition and reinforcement in school-based oral health education – A cluster randomized controlled trial. BMC Public Health 2016;16:2. Al-Kheraif AA, Al-Bejadi SA. Oral hygiene awareness among female Saudi school children. Saudi Med J 2008;29:1332-6.